From May through July in areas of moderate to slow flow with cover such as mussel shells, woody debris piles, bottles and cans. The male guards the nest continuously until the eggs hatch. Females produce approximately 80 to 300 eggs per breeding season. Incubation period varies depending upon water temperature. Juveniles are typically 2 in. long at age 1. Both sexes mature at 2 to 3 years of age. The Carolina madtom occurs from the Coastal Plain of North Carolina to the lower Piedmont in the Tar River and Neuse River drainages. These drainages are recognized as having distinct populations of the species. So the Carolina madtom has a different status listing in each basin as noted earlier in this profile. Throughout its range, the Carolina madtom’s distribution has become fragmented and reduced by dams and urbanization. Recent survey efforts in the upper Neuse River Basin indicate that this population may warrant a more critical listing than “Special Concern”. The Carolina madtom is one of six madtoms that occur in North Carolina. It belongs to the family Ictaluridae, which also includes the better-known bullheads and catfish. Other than its small size, the main difference between the madtom and its counterparts is that the madtom’s adipose fin is fused to its caudal fin. The genus name Noturus, which means “back tail” in Latin, refers to this fusion. Described in the late-1800s by ichthyologists Jordan and Meek, this fish is the only madtom that is endemic to North Carolina, as indicated by its common name. Like other species in this subgenus, the Carolina madtom has well-developed serrae (saw-like projections) on both edges of its pectoral spines. Its species name is furiosus—Latin for “mad or raging” —because observers have noted it to be the most strongly armed of the North American catfishes. The poison in the tips of its serrae is more potent than that of other species. The name “madtom” is thought to have come from the fish’s erractic swimming behavior when captured. This small fish reaches a maximum length of nearly 5 in. When compared to other madtoms, the Carolina has a short chunky body and a distinct color pattern. Three dark saddles along its back connect a wide black stripe along its side extending from its snout to the base of its tail. The adipose fin has a dark blotch that does not quite reach the fin’s edge, giving the impression of a fourth saddle. Yellowish to tan blotches space the saddles, while the rest of the fish exhibits a tan color. 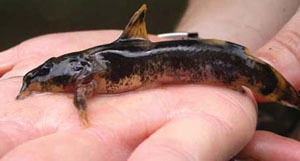 The Carolina madtom’s belly is not speckled, and the tail has crescent-shaped brown bands near its edge and center. The Carolina madtom occurs only in portions of the Tar and Neuse river basins in North Carolina. It tends to occupy the relatively larger streams that flow into the Tar and Neuse rivers, which further limits its range and abundance. Because the species has a restricted range and occurs only in certain types of waters, the N.C. Natural Heritage Program lists the Carolina madtom as “Significantly Rare” for the Tar River Basin population and as a species of “Special Concern” for the Neuse River Basin population. Its small size makes it unappealing to anglers, and it is classified as a nongame species. The Carolina madtom occurs in freeflowing clear to coffee-color streams. Typically, it occurs in streams with sand, gravel and detritus bottoms. Although it tends to avoid areas with large submerged plants, specimens have been collected from small patches of vegetation. During the warm months, adults tend to occupy areas near swift current where the depth reaches a maximum of about 1 meter. Juveniles inhabit shallower riffles and runs with slower currents, but some overlap does occur. During the breeding season, which occurs from May through July, these madtoms shift to areas of moderate to slow flow with abundant cover in the form of mussel shells, woody debris piles, bottles and cans. The debris is used for nesting. The female produces approximately 80 to 300 eggs per breeding season, and the male guards the nest continuously until the eggs hatch. Juveniles are typically 2 in. at age 1. Both sexes mature at age 2 to 3 and have a life span of at least 4 years. Like other ictalurids, the Carolina madtom feeds most actively during the evening with peak periods at dawn and dusk. And like other madtoms, it is a bottom-dwelling or benthic insectivore that typically feeds on larval midges, mayflies, caddisflies, dragonflies and beetles. 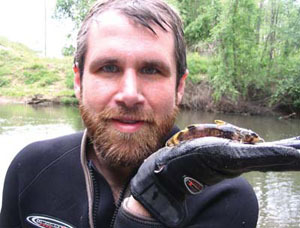 As a nongame fish with a restricted range, the Carolina madtom rarely interacts with people. 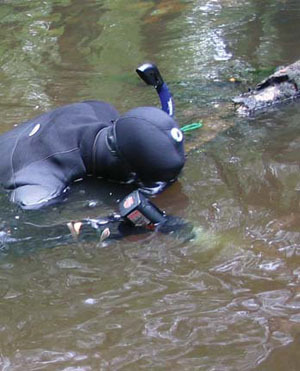 Encounters may occur while anglers are collecting bait from streams or rivers. Any observed specimens should not be handled or otherwise disturbed. These fish are imperiled and have specific riverine needs, so no one should attempt to confine them to an aquarium. If the ongoing urbanization of the state’s landscape continues to cause declines for this species, future interactions between people and this rare but beautiful fish may become impossible. 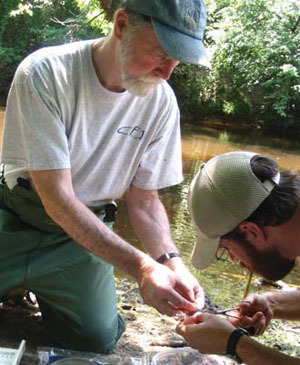 Throughout the 1980s and 1990s, researchers noticed a steady decline in Carolina madtom populations. Biologists with the North Carolina Wildlife Resources Commission launched a project during 2007 to find where the madtoms occurred. They conducted 60 surveys throughout the Tar and Neuse river basins to determine the status of this Carolina treasure. Data collected during the surveys suggest that the Neuse basin populations have dramatically declined over the past several decades. The Carolina madtom was discovered at a mere 10% of the areas where the fish historically occurred. Only two populations were identified during the 2007 surveys in the entire Neuse Basin! On the other hand, the Tar Basin populations are doing much better; 90% of the sites sampled that historically harbored the Carolina madtom still maintain healthy populations. Armed with this valuable information, NCWRC aquatic biologists can now make recommendations concerning management and restoration actions for the remaining Carolina madtom populations. These projects should help reestablish populations of these rare animals to their native range. Burr, B. M., B. R. Kuhajda, W. W. Dimmick & J. M. Grady. 1989. Distribution, biology, and conservation status of the Carolina madtom, Noturus furiosus, an endemic North Carolina catfish. Brimleyana 15: 57-86. Menhinick, E. F. 1991. The Freshwater Fishes of North Carolina. Raleigh, N.C.: N.C. Wildlife Resources Commission. Page, L. M. & B. M. Burr. 1991. A Field Guide to Freshwater Fishes: North America North of Mexico. Peterson Field Guide Series, No. 42. Boston, Mass. : Houghton Mifflin Co.
Rhode, F. C., R. G. Arndt, D. G. Lindquist & J. F. Parnell. 1994. Freshwater Fishes of the Carolinas, Virginia, Maryland, and Delaware. Chapel Hill, N.C.: The University of North Carolina Press. Illustrated by Duane Raver. Photos by N.C. Wildlife Resources Commission. Yesterday(1-10-13) My Biology class collected what appears to be a Carolina Madtom in Nash County near Rocky Mount Academy in a small drainage stream that runs along a Frisbee golf course and joins with Maple Creek. It measured 9 cm and was collected from a small riffle in clear water, some detritus was present on the bottom of the stream area. The specimen has been returned to the collection location. Maybe we will see more in the spring. I lived on the Biltmore Estate during the 1940's and early 1950's. There was quite a few of what we called Stone or MadTom catfish in two small streams (what we called "Branches") at that time. We found them as we were hunting for crawfish for fishbait. The streams are on the Biltmore Estate across from where Bent Creek runs into the French Broad River. The place was called Riverside and my family ran a dairy for Biltmore. There were also a few Madtoms in the headwaters of Dingle Creek. June 26, 2011. Observed a Carolina Madtom in Nash County, just north of the where Parkers Creek converges with Swift Creek approximately .5 miles east of NC 43 and 3/4 mile north Browntown Rd.